Indirect Immunofluoresence assay for the detection of Adrenal cortex antibodies in human serum on primate adrenal gland sections. Adrenal antibodies are associated with the idopathic form of Addison's Disease. 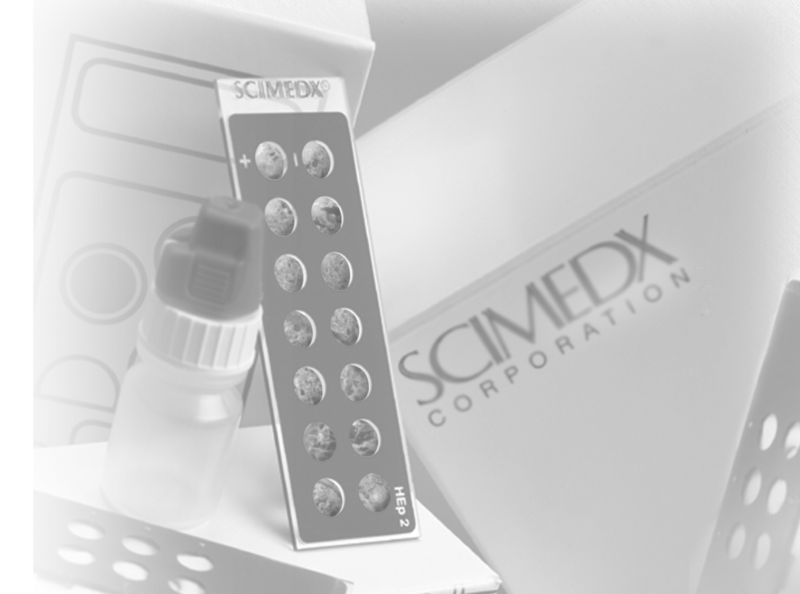 Indirect Immunofluorescence Assay is a qualitative or semi-quantitative assay for the in vitro diagnostic detection of Anti-nuclear Antibodies in human serum on human epithelial cells (HEp2). The test is intended as an aid in the diagnosis of SLE and connective tissue diseases. Indirect Immunofluorescence Assay for the detection of Anti-nuclear Antibodies in human serum on rat liver sections. The test is intended as an aid in the diagnosis of SLE and connective tissue diseases. Indirect Immunofluorescence Assay for the detection of Anti-nuclear (ANA), Mitochondrial (MA), Parietal cell (PCA), Smooth Muscle (SMA) and Reticulin autoantibodies in human serum on rat kidney/stomach sections. Indirect Immunofluorescence Assay for the detection of Anti-nuclear (ANA), Mitochondrial (MA), Parietal Cell (PCA), Smooth Muscle (SMA) and Reticulin autoantibodies in human serum on rat or mouse liver/kidney/stomach sections. Indirect Immunofluorescence assay for the detection of Anti-Neutrophil Cytoplasmic antibodies in human serum using ethanol fixed human neutrophils as substrate. This test is intended as an aid in the diagnosis of Wegener's granulomatosis, Idopathic Crescentic Glomerulonephritis, Microscope Polyarteritis and Pulmonary Renal Syndrome. Indirect immunofluorescence assay for the detection of Cardiac Muscle antibodies (CMA) in human serum on primate or rat heart sections for the aid in the serologic assessment and possible detection of cardiac disease. An indirect Immunofluorescence assay the detection of antibodies to native dsDNA in human serum utilizing Crithidia luciliae antigen slides. ANA antibodies are present in theblood of patiences with certain connective tissue disorders. SLE patients produce many different types of nuclear antibodies, and those with the specificity for dsDNA have a high correlation with SLE patients. An Indirect Immunofluorescence assay for the qualitative and semi-quantitative detection of IgA Endomysial antibodies (EMA) in human serum on primate esophagus sections as an aid in the diagnosis of celiac disease. Indirect Immunofluorescence assay for the detection of Glomerular Basement Membrane antibodies (GBM) in human serum on primate kidney sections as an aid in serologic assessment and possible detection of kidney disease. Indirect Immunofluorescence assay for the detection of Islet Cell antibodies in human serum on primate pancreas sections. Islet Cell antibodies have been associated with a group of "Autoimmune" endocrine disorders, more specifically with insulin dependent diabetes. Indirect Immunofluorescence Assay for the detection of Mitochondrial antibodies (MA) in human serum on rat kidney sections. Mitochondrial Antibody are circulating autoantibodies in chronic liver disease and are of clinical importance in the differentiation of chronic active hepatitis (CAH) from chronic persistent hepatitis (CPH), and is particularly useful in the diagnosis of primary biliary cirrhosis (PBC). Indirect Immunofluoresence assay for the detection of Ovarian antibodies in human serum on primate ovary sections. Indirect Immunofluorescence assay for the detection of Anti-Neutrophil Cytoplasmic antibodies in human serum using formalin fixed human neutrophils as substrate. This test is intended as an aid in the diagnosis of Wegener's granulomatosis, Idopathic Crescentic Glomerulonephritis, Microscope Polyarteritis and Pulmonary Renal Syndrome. Indirect Immunofluorescence Assay for the detection of Parietal Cell antibodies in human serum on rat stomach sections. Patients with antibodies to PCA or intrinsic factor (or both) have atrophy of the fundal mucosa (Type A) and a very high rate of pernicious anema, often associated with other autoimmune endocrine disorders. Indirect Immunofluorescence assay for the detection of Reticulin IgA antibodies in human serum on rat liver/kidney/stomach sections. These antibodies react to the Reticulin antigens most frequently associated with Celiac Disease and Dermatitis Herpetiformis. These antibodies appear to be stimulated by bacterial or nutritional antigens. immunofluorescence assay for the detection of skin antibodies (Basement Membrane antibodies and Intercellular Substance antibodies) in human serum on primate esophagus sections as an aid in the diagnosis of skin and systematic diseases. Indirect Immunofluorescence Assay for the detection of Smooth Muscle antibodies in human serum on rat stomach sections. SMA can be demonstrated in patients with acute and chronic hepatitis: the highest titers occurring in chronic active hepatitis (CAH). Indirect Immunofluoresence assay for the detection of Striated antibodies in human serum on primate or rat striated muscle sections. Clinical and experimental evidence strongly suggests that circulating antibodies directed against acetylcholine receptor (AChR) and muscle cell antigens are more important in the pathogenesis of myasthenia gravis. Indirect Immunofluoresence assay for the detection of Submaxillary antibodies in human serum on primate submaxillary sections. Indirect Immunofluorescence assay for the detection of Testicular antibodies in human serum on primate testes sections. Indirect Immunofluorescence Assay for the detection of all thyroid autoantibodies and as a quantitative test for microsomal antibody in human serum on primate thyroid sections. The detection of thyroid antibodies is important in the diagnosis of autoimmune thyroid diseases particularly in patients with subclinical autoimmune thyroiditis.